Bankruptcy is a last resort option for people in debt. There are different types of bankruptcy and some are designed for particular circumstances. Many Americans use Chapter 7 or Chapter 13 bankruptcy to discharge debt so they can begin living a financially comfortable lifestyle. This article focuses on Chapter 7 bankruptcy, defining it and explaining its impact. An individual or a business may file for Chapter 7 and the relevant proceedings last for three to six months. Eligibility includes showing that enough money cannot be made to fund a repayment plan included in Chapter 13 bankruptcy. Chapter 7 is considered liquidation, meaning that some property owned by the individual is sold and the proceeds are used to repay debts. Not all property is subject to seizure, with clothing, vehicles, and furniture included in exempt property. 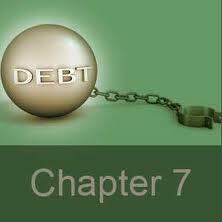 Unsecured debt, which is not guaranteed by collateral, is wiped out during Chapter 7. This includes unsecured loans and credit card debt. For secured debts, the individual must choose whether to continue to make payments on the debt, have the creditor repossess property securing the debt, or pay the equivalent of the replacement value of the property. Some secured debts may be wiped out during Chapter 7. However, past-due taxes, alimony payments, student loans, and child support cannot. There are many differences between Chapter 7 and Chapter 13 bankruptcy. One of the main ones is that with Chapter 7, the individual usually must pay the wholesale value for a home or car or return the item to the creditor. Under Chapter 13, the individual is usually permitted to keep a car or home as long as the repayment plan is maintained. If a creditor objects to the discharge of a debt acquired through a crime and can prove the criminal act, the debt will probably not be discharged. With Chapter 13, the debt must be paid for through the repayment plan but any balance remaining after the bankruptcy is discharged may be forgiven. If an individual filing for Chapter 7 has a co-signer for a personal loan, the creditor can seek payment from this individual, while it cannot do so under Chapter 13. Individuals who have nonexempt valuable property must surrender this during Chapter 7 bankruptcy unless they pay the fair market value for the item or exchange it for exempt property of equal value. To learn more about how to discharge debt through Chapter 7 bankruptcy, consult a debt management professional. What Debts Does Chapter 7 Bankruptcy Typically Eliminate?